Pupils 'are urged to drop maths' in the UK. "Pupils are being discouraged from taking A-level maths as schools in England chase higher places in the league tables, scientists have claimed." If the school performance is measured in students' grades or exam results, then this sounds like an obvious tactic. What I am about to explain you might have already found out... but this is the first time I'm announcing it on my blog. 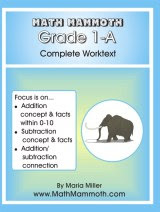 Starting in June 2007, WinterPromise will carry a Math Mammoth complete curriculum for grades 1-3! These new books constitute a complete mathematics curriculum for grades 1, 2, and 3, and will be offered exclusively via WinterPromise during year 2007 (not even sold on my website for that period). Each grade level will be offered as a printed textbook and a CD, or a CD alone. The entirety of the textbook is on the CD, and can be printed for use within a family for unlimited use. The CD will also contain answer keys, tests, and an easy access to script-made free worksheets. I just recieved an email from a publishing company. They want to send me a few books to review and then list on my site. I've written reviews before, a whole bunch. I started my "reviewer career"... well, in school of course. We wrote book reviews, as I'm sure you did too. I don't think mine were that special. But somehow the role of reviewer has fallen to my lap nowadays. For example, recently I just finished the review of YourTeacher and MathScore. A collection of short detective stories for young adults who are interested in applying high school level mathematics and physics to solve mysteries. The Cryptoclub: Using Mathematics to Make and Break Secret Codes. Join the Cryptokids as they apply basic mathematics to make and break secret codes. This book has many hands-on activities that have been tested in both classrooms and informal settings. I'm bad at math... and fine with that! I just received a nice article from Jim Stone, a math teacher at Global Institute of Mathematics. I enjoyed it; I thought you might too. I've seen this issue raised and talked about elsewhere as well. Namely, that it seems to be socially acceptable to admit how bad you're at math... while no one would comfortably admit that they can't read. I'm bad at math and I’m okay with it! For the past eighteen years I’ve been reading articles and editorials lamenting the mathematical performance of America’s school children. It has become an annual ritual for politicians and educators alike to bemoan the results of the latest tests showing American kids falling behind their international counterparts. What is the problem? More importantly, what is the solution? I've recently embarked on something new... I let people request a package of over 100 free worksheets and over 180 sample pages from the Math Mammoth books and worksheet collections. In it, I included one question along with the name & email that people can fill in: "What is your most pressing math teaching question?" I did that because I saw some other people had done something similar, and I thought that's a great idea - I would get to know what kind of math teaching related problems people have. I also wanted to give people a chance to communicate a little with me... You know, we all go visit these multitudes of websites, and we show up as numbers on the website statistics program. It all can seem so impersonal, so "machinistic" sometimes. But the reality is, behind every website are people. On school days, over 10,000 people visit HomeschoolMath.net. Over 1,000 people visit MathMammoth.com. I never hear from most. Due to a very unfortunate illness, the Homeschool Blog Awards website may not be able to post the prizes that the winners will get. Since I am one of those that have promised prizes, I will just go ahead and post what I'll give here on my blog, to help out a little. And... you can also request a FREE sample package that contains over 100 worksheets from the Math Mammoth Golden Series collections and over 170 other sample pages from the Blue Series books. Voting has begun at the Homeschool Blog Awards web site, for the belated 2006 Homeschool Blog Awards. You can vote till Friday. 1) YourTeacher.com - online math lessons that consist of video and audio clips, practice problems, solutions to those, "Deep Thought" question, and a quiz. The list of lessons is long - and thus the amount of material is huge. It covers all topics from prealgebra through algebra 2. I found the lessons to be very good. Read the review, or visit the website and see their sample lesson. 2) MathScore.com - online math practice environment. This is an intelligent system which catches the student's mistakes and adapts the practice accordingly. For each topic there are several levels of difficulty, and the student is motivated to compete against him/herself to attain higher levels. I would like to know a simple activity that i could do with a grade 2 student, which involves using the calculator. Here are a few ideas. Hopefully they are of help. Add or subtract the same number repeatedly. For example, start with 5, subtract 1 several times, and let the child see what happens -- he/she will get to negative numbers! Similarly, ask the student to start with 40 and subtract 10 repeatedly. Some children will be surprised at the negative numbers they will see -- but many will be able to understand the basics of how they work, just from simple calculator activities like these. Start with any 2-digit number and add 100 repeatedly. For example, starting with 17, your 2nd grader will see the sequence 17, 117, 217, 317, 417, and so on. Start with a 3-digit number and subtract 50 repeatedly. Again, you will get a definite pattern. I received recently the book Arithmetic for Parents. A book for Grownups about Children's Mathematics by Ron Aharoni. I think this book is exceptionally good, and very worthwhile to read if you're a teacher OR a parent. Ron Aharoni was like many: he thought he could easily teach elementary school mathematics because he knew college level math and beyond (he was teaching math in a university). But... he was in for a big surprise when he entered the fourth, fifth, and first grade classes in a backward town in northern Israel, in 2000. ...he did NOT know how to teach elementary mathematics, in spite of his knowledge of university level math.